Five times a year, the movers and shakers in minerals exploration, engineering, technology, investment, and service and supply providers gather to hear from Australia’s innovative and emerging mining industry businesses within the more informal environment of the Swanston Room at the Melbourne Town Hall. 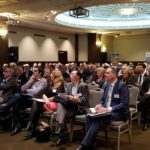 Our highly-popular Cutting Edge series is sponsored by the Victorian Government’s Department of Economic Development, Jobs, Transport, and Resources as well leading international professional services group, PwC Australia. Dynamic Melbourne-based engineers, Mincore, sponsor our post-event networking. Tuesday 5 March; Tuesday 14 May; Tuesday 16 July; Tuesday 10 September; Tuesday 12 November. PLEASE NOTE: These dates are subject to confirmation. Bellevue Gold Limited (ASX : BGL) is a West Australian gold exploration company. The Company’s core asset is the historic Bellevue Gold Mine in Western Australia which was one of Australia’s highest-grade gold mines producing around 800,000oz @ 15g/t gold. Guest speaker: Steve Parsons, Managing Director. Prodigy Gold NL (ASX: PRX) is accelerating exploration and development in one of the most exciting frontier regions for gold in Australia. Along with JV partners IGO and Newcrest, Prodigy is exploring its 100% owned projects in a region containing the proven multi-million ounce Callie Gold mine in the Northern Territory. Guest speaker: Matt Briggs, Managing Director. Speciality Metals International Limited (ASX:SEI) is a diversified speciality resources, mining and exploration Company that is in the final stages of securing capital for the recommencement of operations at its flagship Mt Carbine Tungsten Project in Far North Queensland. The Company also hosts a diversified exploration portfolio of highly prospective gold and tungsten exploration licences in Australia along with a number of valuable mineral exploration concessions within Chile. Guest speaker: Russell Krause, Executive Chairman. Xanadu Mines Limited(ASX & TSX) is a leader in the search for gold and copper in Mongolia. The flagship Kharmagtai Copper/Gold Project – containing 1.9Mt of copper and 4.3Moz of gold – is emerging as a world-class asset. Guest speaker: Andrew Stewart, MD & CEO.